The Paw Print Blanket is simple use anywhere pet blanket. 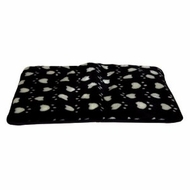 The top is a soft padded sleeping or resting area with an attractive Paw print pattern. Durable bottom liner gives this blanket the ability to be used anywhere. Great for covering Car seats, Sofas, Chairs, etc.... The small Paw Print blankets measures 18" X 22". Washable and easy to clean this blanket is ideal for home and travel.